Blog and News | GreenRope :: Total Cost of Ownership: What does it mean and how can you avoid costly, unsuccessful implementations. CRM and marketing automation have quickly become industry norms, finding themselves embedded into the core of businesses everywhere. However, purchasing a software platform is the easy part, successful implementation is an entirely different story. Onboarding new software into your organization takes time, skill, and strategy. WIthout the proper training or if you choose the wrong system for your business, implementations can be costly and so can the expenses for the life of your subscription. Put simply, this is the sticker price vs. the long-terms costs. This is called “Total Cost of Ownership”. The Total Cost of Ownership of a software purchase refers to a single value on the lifetime of that software. This value includes all expenses that go into implementing and operating the platform. These are just some aspects of what you can expect to pay for when implementing any software let alone multiple software systems. What happens when you have multiple systems in place? Multiple systems mean multiple bills mean higher cost of ownership. This expensive strategy is only part of the problem, however. When you invest in multiple disparate systems, you end of up with fragmented data that can significantly affect your sales and marketing efforts. Many small business will start out finding the least expensive, or free software to get started, but later find themselves paying far more in the long run. While the freemium option might seem fine now, down the road, you will find yourself encountering far more problems and expenses than you initially expected. As business owners, marketers, sales professionals and operations masters, it’s important to understand your options when it comes to technology. You entire team should be onboarded with the technology and able to utilize it to benefit their jobs and the company as a whole. Each department handles customers and customer data in one way or another, so doesn’t it make sense that all data is housed in the same place and not disparate platforms? This solution is a custom solution that your developers create. This is not an out-of-the-box solution, this is completely customized, making it the most expensive option to develop, implement and manage. These are expensive enterprise solutions built for large businesses. They are costly, require long implementation timelines and are typically quite complex. They also usually do not come with additional integrated features, like marketing or customer support. Complete CRM is a newer kind of software that integrates sales, marketing, operations and customer service into one platform. This type of solution typically has the lowest total cost of ownership since you are investing in one platform for the entire team. As you can see out of these three options, the first two require significantly larger upfront costs as well as long-term costs like maintenance, new development, and more. Complete CRM on the other hand, saves a business thousands of dollars every year. When you have all of the features you need for your entire team (sales, marketing, operations, customer service) in one place, you avoid the investment in multiple systems, training, and support. Complete CRM helps you simplify while making your team more effective. Many new business owners opt for freemium models or feature-specific platforms that only meet their current needs. The problem with that is while they may feel they are saving money, they are actually costing themselves more in the long-run. Don’t just choose the software that you need now, think about your growth and the features you will need in the future. Choose your software wisely. Understand ALL the costs associated with that software solution. Do you have unlimited users or do they charge per seat? What is their support like? Do they offer free 24/7 support? Do you have to pay for additional features like marketing automation, customer service, event management, landing page builder? A pay-per-feature solution can become costly really quickly if you have to pay for every additional feature. What kind of onboarding do they have? What are the costs and what do you get? Does the company offer additional services like email template creation? Keeping this kind of stuff under one roof is often a money-saving strategy as well. Select a software that your entire team can use. All of your data should be in one easy-to-use, safe place. Every department needs and uses data. So get each person setup with their own logins and passwords for collaboration, transparency, and accountability. On average, GreenRope saves our users over 90% total cost of ownership. Why? Because we integrate all the tools you need, including small business CRM, marketing automation, and operational tools into one tightly packaged software. 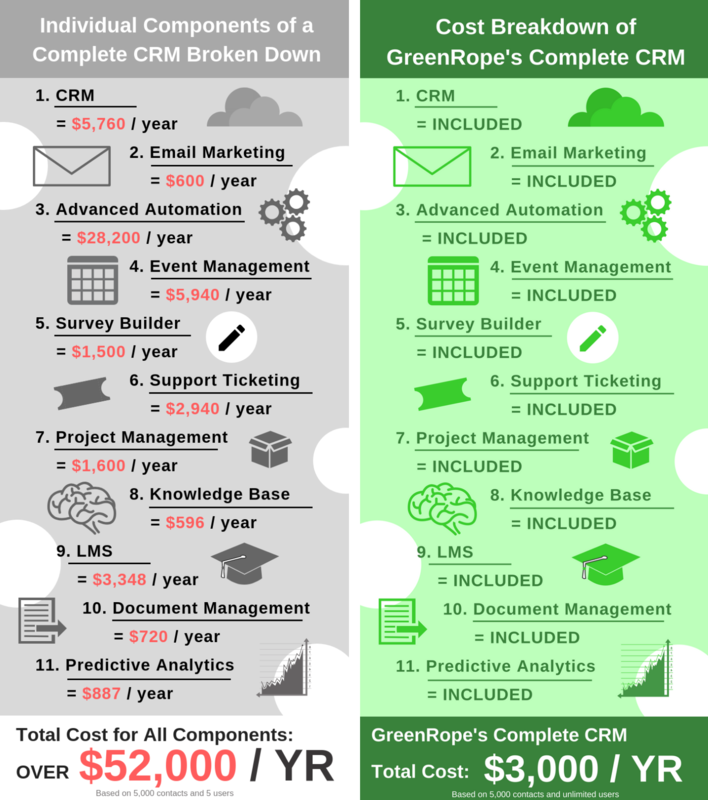 Are you ready to save and succeed with GreenRope?